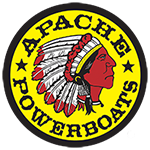 No matter whether you choose an understated color or sizzling hot bright shade, the Apache Powerboats logo speaks out. It tells stories of action, adventure, and above all, daredevil speed. You know that story, and that’s why you’re about to choose a high-performance tee shirt to commemorate it. After all, your Apache Powerboat is your favorite thing. And who can blame you? Certainly not those who shoot you envious glances as you pass by in your tell-all Apache Powerboats tee shirt! The bold, silk screened logo is made to last, and you’ll wear it as boldly as you will open the throttle and get that incredible thrill of a beautiful machine doing what it does best – RACING!